← The IPO is Nice. But Quiet is Kept, Facebook’s Micropayments Are the Truth! When Social Media Attacks: Susan G. Komen, What Were You Thinking?!! Susan G. Komen effed up big time! A few days ago, the Susan G. Komen Foundation, cut Planned Parenthood’s funding for breast cancer screening. Planned Parenthood offers almost a million breast cancer screenings a year, and without the support of organizations like the Susan G. Komen Foundation, hundreds of thousands of women will no longer be able to avail themselves of the benefits of screenings and early detection. Citing a pending investigation against Planned Parenthood, the Foundation’s true motivations were quickly exposed as bowing to Republican anti-choice pressure. The response to the foundation’ actions was as swift as it was passionate. The social media response was immediate and massive - check the shares! Thousands shared their outrage and posted their reactions on Facebook and Twitter. Overnight, advocacy groups set up websites calling attention to the fight and asking visitors to sign and share the petitions. 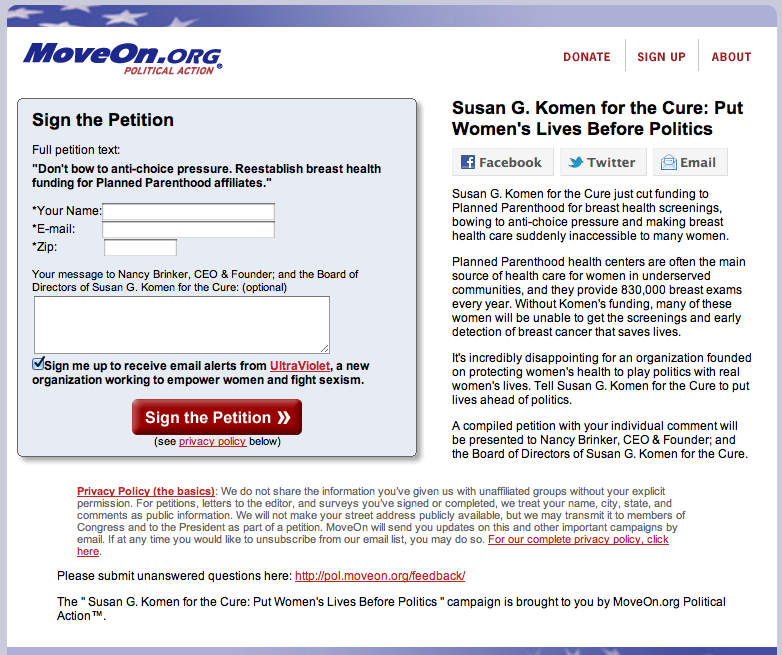 MoveOn.org and other organizations quickly established online petitions. No less than four separate online petitions were created, each calling on visitors to tell the Foundation to reverse it’s decision. Hundreds of thousands of people shared the story, through links on Facebook, videos, tweets and various online calls-to-action. The Foundation also set it’s damage control units to work, issuing (inconsistent) statement after (inconsistent) statement, trying to clean up it’s mess (but only adding fuel to the fire). Cutting funding for Planed Parenthood’s breast cancer screening is the antithesis of this mission, and the executives at the Foundation who participated in this are feeling a social media magnified wrath that is unprecedented in the history of the organization (and likely most philanthropic organizations). The growing sentiment, both internally and externally, is that the Foundation waded into muddy waters (the debate on abortion), and should remain focused on it’s mission, fighting breast cancer. Clearly, the powers that be at SGK are scrambling to make things right. Unfortunately, in this day and age of social media, where bad news travels faster than the speed of light, ‘making things right’ are often easier said than done. Whatever happens, someone will have egg on their face, and I imagine that someone will step down/fall on their sword/be the scapegoat for this debacle. Hopefully, this lesson will be learned: if you’re going to do something unpopular, be prepared for the social media backlash. UPDATE: Politico.com just reported that the Susan G. Komen Foundation backed down from it’s earlier stance and has restored funding to Planned Parenthood. Power to the people (and social media)!! Thank goodness! 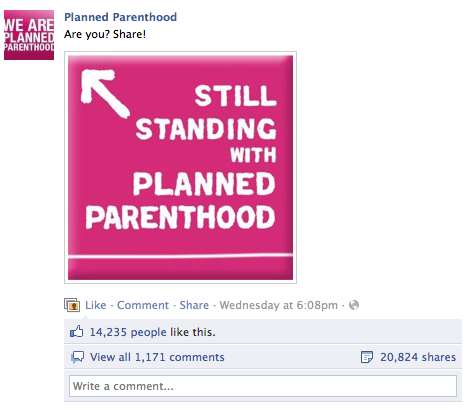 I worked there for a year (Planned Parenthood) after college and it goes without saying that they do incredible work. Thanks to facebook the wrongs have been made right!